Our work for the first semester has been finished, submitted and marked, so I thought I’d post a summary of the briefs and pieces, and a quick update as to what’s been happening and what’s to come! The International School of Typography Design (ISTD) set a brief that was to focus on a moment in time. I have previously explained about this brief, but as a summary, I chose 31st of October, the day the population hit 7 Billion. I created a typographic poster, about the facts and effects of this big number. It was very well received by my lecturers, and schools, and is now being used as part of a Welsh Baccalaureate lesson plan! It all worked out much better than I could ever imagine, and is the basis now for one of my final major projects, but I’ll talk about that in another post. (I’ll be uploading a photo of the printed version soon, that’s still at my university). The next brief was from the Royal School of Art (RSA), and that was to create a set of stamps to encourage people to keep writing letters. 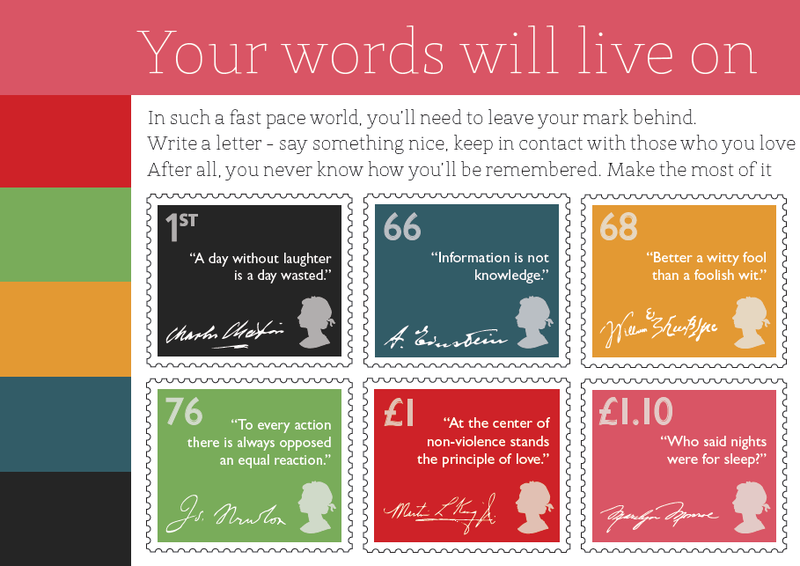 I chose the idea of ‘Your Words Will Live On’ and giving examples of famous quotes that have lived on pass the death of the person in question. I wasn’t so keen on the final layout, but my lecturers were very happy with the final design, and it was well received all around (success!). 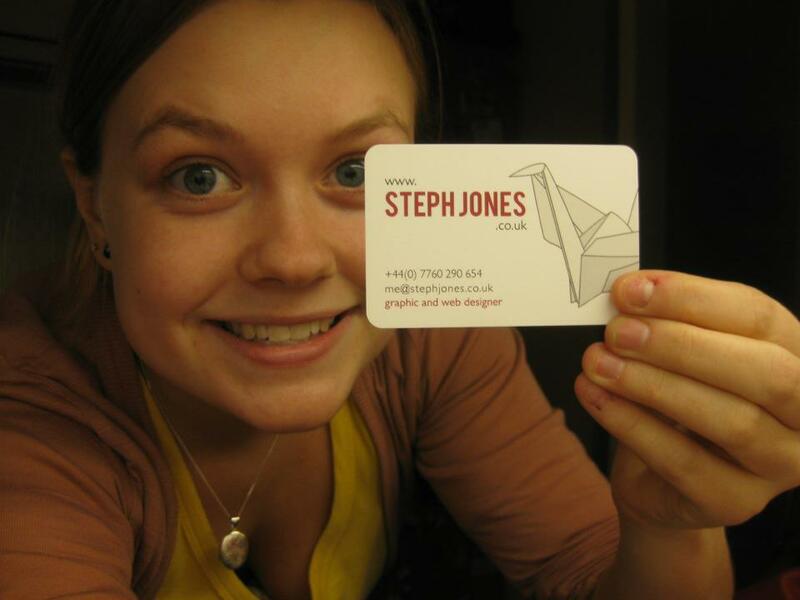 And last, and definitely least, the personal identity brief. Pretty self explanatory, this brief was to create our own branding, and overall image. We had to create a website, business cards, and an ‘object’ which we would design and bring to interviews to boost chances etc. I didn’t have many idea’s for this for a long time, but eventually settled on an idea using cranes/swans oragami, and was pretty happy with it! (More-so than the other projects!) But oh was I wrong. My lecturers didn’t take a liking to my identity, but luckily, it was meant to be the starting point, not the finalised designs. We have another hand in for this module in a few months, so I’ll be set back to designing and web designing, in order to find an identity I feel comfortable with (and they like too..). Overall, I got a first for this submission, and I was over the moon! I really didn’t expect it, after they told me they thought my identity was too linear for my personality. But I’ll get a second chance with that project at the next submission, and hopefully prove them wrong with a new design! Feedback would be really appreciated on any of these designs, and most of all the identity project, so it would be awesome to hear for you! Thanks a lot, and better late than never, a happy new year to you all! This is the first project I have completed for this semester (and my first for my last year in university!). The brief is set from ISTD (International Society of Typographic Design) to create a typographic publication based on a certain day. I have chosen to base my on the 31st October 2011 – the day the 7th billion person was born on earth. I found this so incredible, and started research on a number of different websites. My outcome is designed to display well on iPad, PC and as a printed poster. And here’s the final graphic. I’ve finished it as far as I’m aware, but I’m still open to feedback, thank!